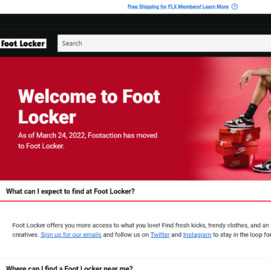 Footaction has men's, women's and children's athletic footwear, apparel, and accessories. Cash Back is not available on purchase of gift cards, Nike Air Foamposite, Lunarglide 6, Air Max Uptempo, Jordan, Kobe, Durant, Lebron, Under Armour Curry, Adidas Ultra Boost and Yeezy shoe releases. Click a Coupon or click Start Shopping to earn 1.5% Cash Back at Footaction.